The title itself makes us question our better senses. 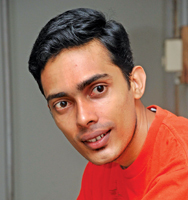 Young dramatist Nalaka Vithanage, the son of reputed stage dramatist Bandula Vithanage, has made a comeback after three years with a new Sinhala play titled Upanda Maranaya (Death on Birthday). The play will go on boards Lumbini theatre on July 12 at 3.30 p.m. and 6.30 p.m.
"It is a political farce and comprises comic situations. The characters as well as incidents have emerged from real life. The action unfolds between seven characters that represent certain figures in the society. The plot is woven around a politician and the people he encounters like his secretary, a famous actress, a police officer and many more," Nalaka gave a brief description on what to watch out for when viewing his play. The story reflects how power lures individuals who are greedy to fulfill their own needs by gaining favour through the politician. He says that the main reason for constructing a play of this nature is to portray the harsh realities in life. "The audience will enjoy the episodes a lot as they involve some hilarious action. However it is not purely aimed at entertainment as they would realise that they would be laughing basically at themselves and similar situations or emotions that they themselves have encountered. The absurd situations in this play are very much on par with reality," he said. Amiththa Weerasinghe, Duleeka Marapana, Bandula Vithanage, Kingsley Loas, Prasad Sooriyarachchi, Ayesha Dissanayake and Upali Bandara make up the cast for the play which is penned, directed and produced by Nalaka. The stage lightening is by Wasantha Kumara, set designing by Rohan Samaradivakara and make up by Nimal Rajapaksa and Gamini Costa. Costumes are sponsored by the Symbosium. Nalaka had previously directed two more plays, Rathri Bojanaya (adaptation of Marc Camoletti's 'Don't Dress for Dinner') in 2004 and Kasi Malla in 2006. His second creation took him to the last round of the State Drama festival in 2006. "The public are once again eager to see quality and meaningful creations today. If you have a lot of faith in your creation in delivering the goods to the contemporary society, no doubt, the hall will fill out for there are still a lot of theatergoers in the island," he said with ample confidence about the audience flocking into theatres. "Now is the best time to engage in drama making as terrorism is eliminated and the public are looking towards the entertainment scene to add colour to their monotonous lifestyle. If you look around you will see that many new plays are going on boards at the theatres. There is a revival in the local stage drama scene." Nalaka is a product of Nalanda College, Colombo and had been involved with the stage ever since his young days, especially because of his father's devotion for the stage. Nalaka recalled, "When I was a kid I used to watch my father engaging in rehearsals. His dedication for the stage inspired me and lured me towards the field. Drama making was an interesting experience for me and I have developed a passion for the subject." Though he had chosen commerce during his Advanced Levels Nalaka stated that he never lost touch with the world of arts. He said that his father consistently roped him in for teledrama projects and stage creations. These experiences were no means loss on the young man for he observed facts and stored them in to be used for his own creations. Nalaka said, "I am reading books on British comedies and farces these days. The Ray Chooney's plays fascinated me because he had used different styles and techniques." 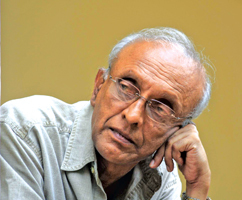 He had also penned scripts for teledramas like Dekona Gini for Swarnavahini. More demand to compose teledrama scripts have come his way after this debut attempt. He had also acted a small part in Hiru Dahasa during his childhood. He is currently employed at the British Council. Queried if he hopes to take the play to other areas of the island Nalaka stated that is one of the missions he has under his belt. He said that a show, organised by the British Council, is already scheduled to take place at Navarangahala on August 2 at 6.30 p.m.